In order to reach the highest satisfactory level of our valuable clients, we offer the best quality GRPF Mill Headstock. Our experienced professionals manufacture this product using the superior-grade raw material and sophisticated machinery. - Diamond Engineering Works has been a cherished name in the field of Sugar Plant/Sugar Mill/Jaggery Plant/Mini Sugar Plants across the length and breadth of India. 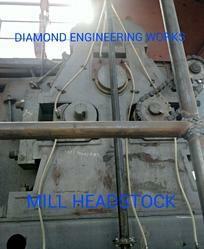 - Company Manufactures a Fabricated Mill Headstock which is largely used in various sugar mills. - Durable in Quality and assures the longer life. - The headstock is a high cage structure, uses Meehanite cast-iron, is heat and annealing treated to ensure spindle concentricity and the parallelisms of the bearings. The lathe Headstock used, at one time, to be called the "Fixed Headstock" or "Fixed Head", and the rotating shaft within it the "Mandrel". Today the mandrel is usually called the "Spindle", but this can cause confusion with the tailstock, where the sliding bar is known variously as the "ram", "barrel" - and "spindle". 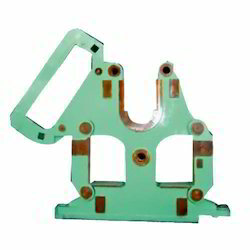 - Designed for good heat dissipation at higher speeds.